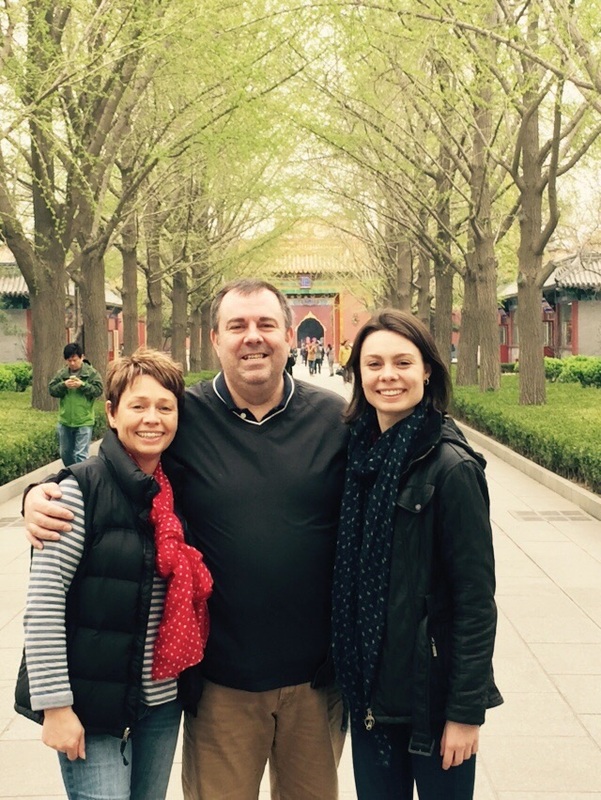 I fell in love with Beijing all over again when my family came to stay and had the most wonderful week as their tour guide, showing them the best that Beijing has to offer. Due to the wonderful weather every day was perfect, so here is a day-by-day guide about how we made the most out of this beautiful city. Mid-morning arrival – I had class in the morning, but went straight to the hotel to meet the family. 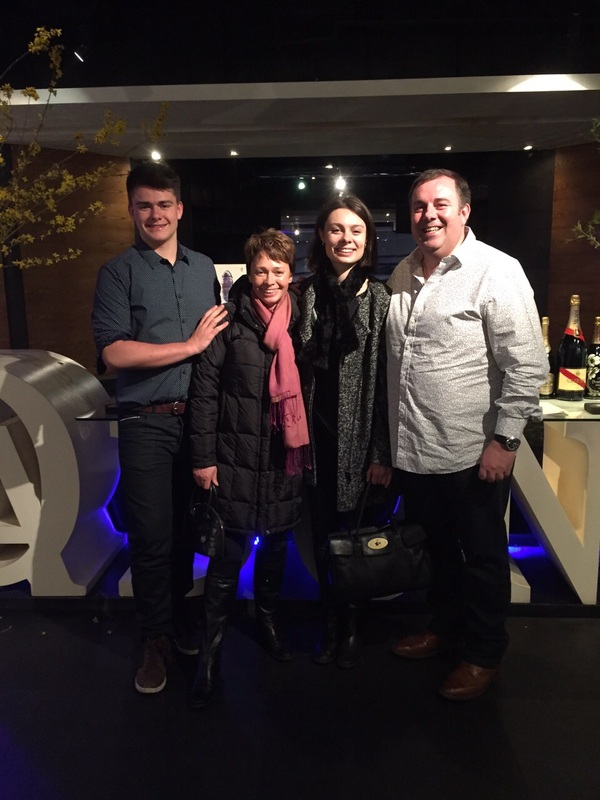 They stayed at the Hilton Wangfujing, which while 40 minutes on the subway from PKU is a perfect location for sightseeing and getting around Beijing. Wangfujing is situated right next to the Forbidden City and Tiananmen, and handily is surrounded by lovely shops and restaurants. Everyone was exhausted after the long flight (Harry didn’t sleep at all) so I thought it best to go somewhere fairly close and relaxing. The Yonghegong Lama Temple is somewhere I’d been meaning to visit after driving by it on many taxi rides, so it was lovely to be able to experience it for the first time with my family. We were given bundles of incense sticks with our entrance ticket and advised to burn 3 sticks at one time. The boys decided to burn all theirs in the first pit, which led to smoke-induced watery eyes and burnt hands, before we realised that they were meant to be rationed throughout the complex. After posing with the imposing bronze tigers, we visited the rest of the temple halls and ended our visit in a museum explaining the history of the temple and Buddhism in China. Our next stop is a favourite – Wudaoying Hutong is a five-minute walk from the Yonghegong Lama Temple and is accessible by subway (Andingmen Station and Yonghegong Lama Temple take you to either end). The hutongs are an integral part of Beijing’s history and are basically long streets, lined with “siheyuans” or courtyard houses. Wudaoying Hutong is one of the better-kept hutongs, and is filled with cool coffee shops, cute craft stalls and lots of restaurants, varying from Western to Chinese, and vegetarian to sausage emporiums. We settled for a drink in Daily Routine before heading back to Wangfujing for a delicious Thai meal in the APM Mall next to the hotel. 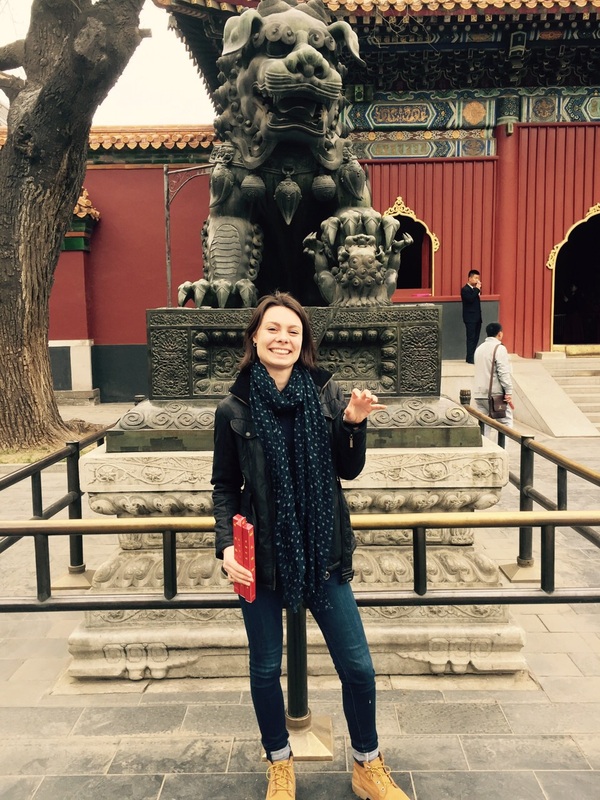 I had class from 8am to 5pm, so I suggested going to the centre of Beijing (a 5 minute walk from the family’s hotel) to see the best that Beijing has to offer – Tiananmen Square and the Forbidden City. The Forbidden City (otherwise known as the Imperial Palace) is a massive complex, famously depicted by the large picture of Mao Zedong on the imposing gates. It is in Tiananmen that you can also go to Mao’s Mausoleum to see his embalmed body, but due to large queues and peculiar opening times (as well as the fact that the family didn’t want to spend their holiday time looking at a dead body), we decided against it. Tiananmen is surrounded by very imposing official buildings, including the National Museum and the main CCP meeting rooms. While Tiananmen won’t win any beauty contests, it’s interesting to go to gauge the scale of the square and admire the astonishing amount of security cameras per square metre. 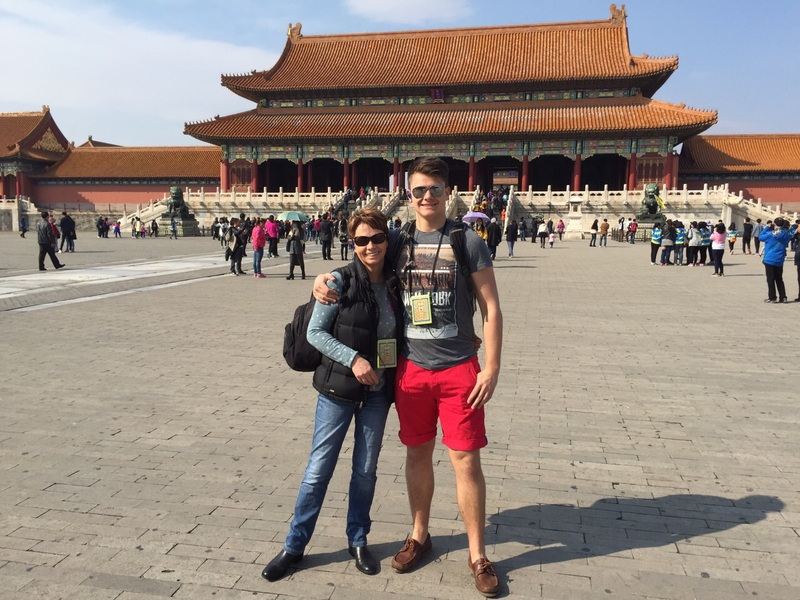 The Forbidden City underwent a facelift prior to the 2008 Olympic Games, and is a wonderful way to spend a few hours. However, it is composed of a series of large open courtyards, so weather is an important consideration. I went in the depths of Beijing winter and it was freezing, and I imagine the heights of summer would be equally unpleasant. Sun-screen at the ready! 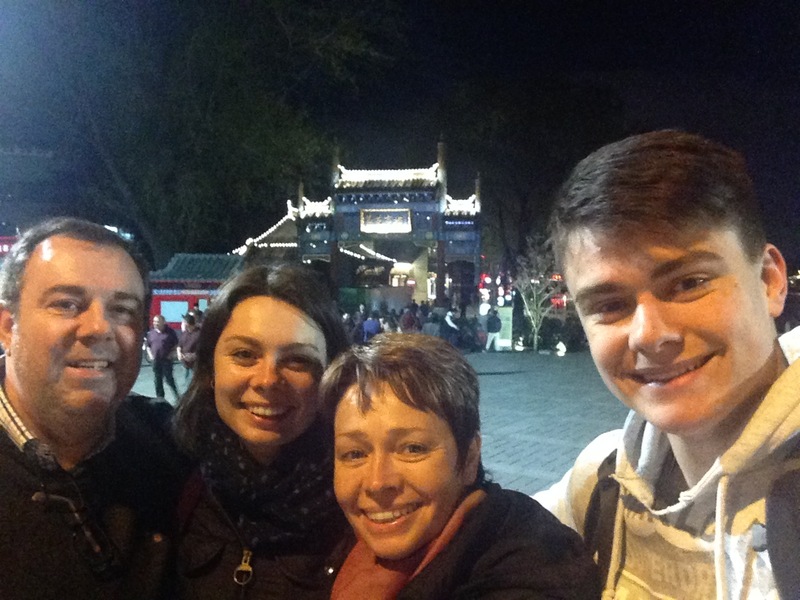 After initial confusion with subway exits, I met my family near the Beijing Drum and Bell Towers to go for dinner so I could catch up about their day. The restaurant of choice was the wonderful Palms LA, a Mexican Korean fusion restaurant that does the best rosemary salted chips and Mexican pork bibimbaps in Beijing. We made the most of happy hour before 8pm as the family regaled me with tales of their day over passion-fruit mojitos. After dinner, we wandered towards Houhai, a lively bar area surrounding a lake for a few more drinks. A perfect end to a lovely day! 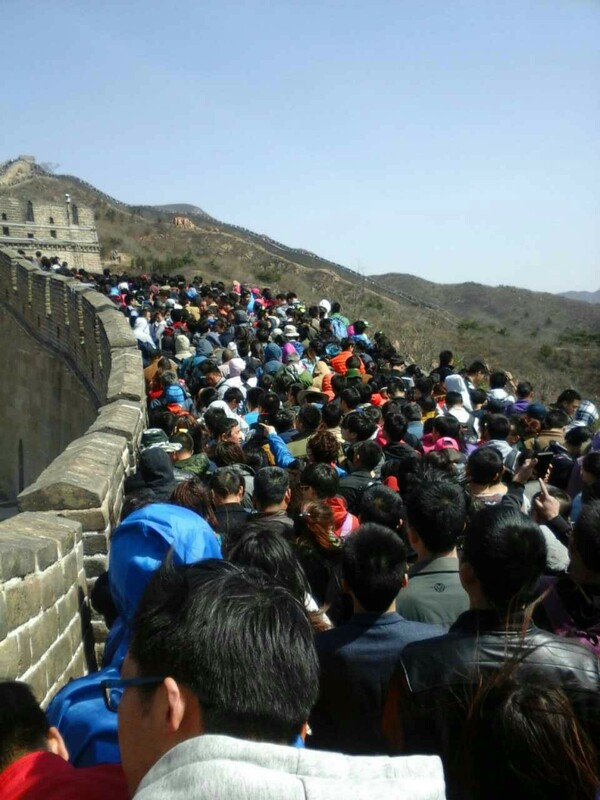 I once again had class on Friday morning so I suggested a trip to the Great Wall before the holiday weekend. The weather was absolutely beautiful so I was very sad to traipse to class knowing what fun the family would be having. 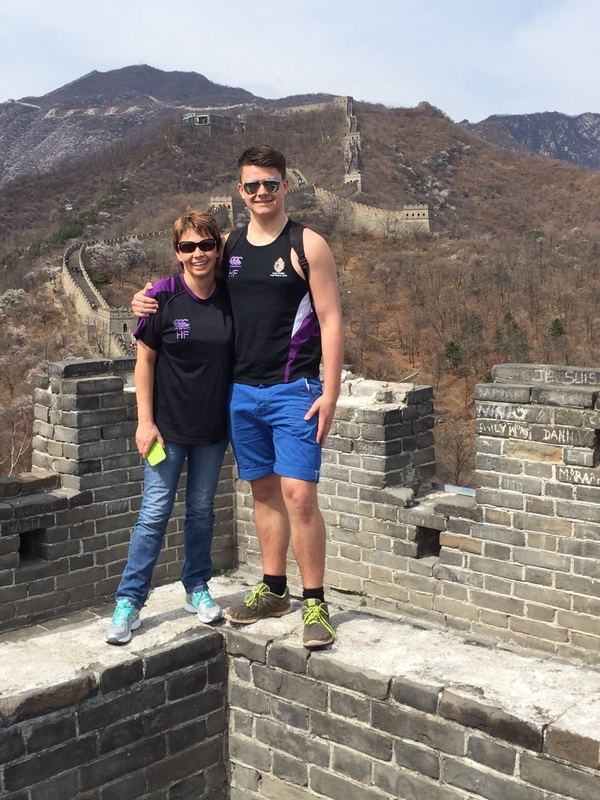 There are a few choices for which part of the wall to visit if you’re based in Beijing, but in my opinion Mutianyu is by far the best option. Badaling is the most tourist-saturated area due to its good transport links but it’s absolutely the hassle to get the bus or find a car to take you to Mutianyu. It takes around 2 hours to get there, and spending 2-3 hours of walking and sightseeing is enough. This part of the wall also has a gondola or chairlift to take you up, and a luge if you dare on the way down. 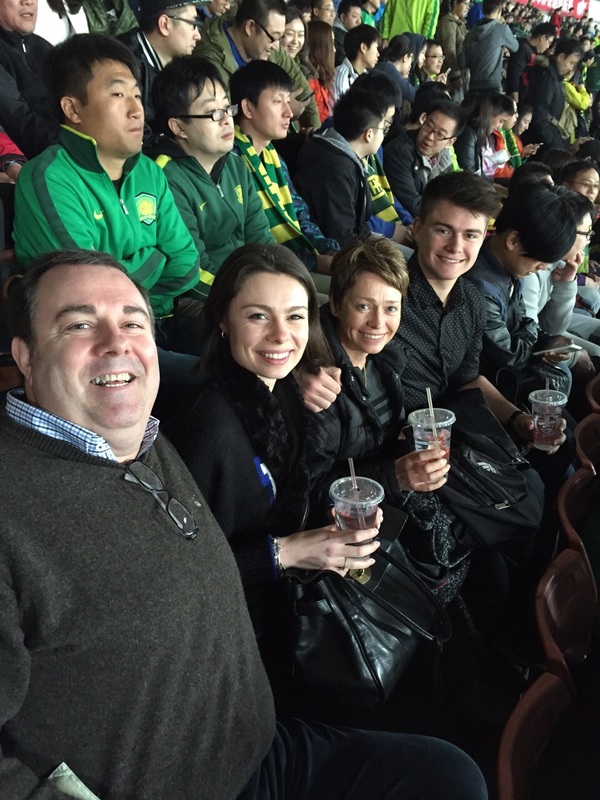 I later met the family at the hotel when they returned and after my class, and after a quick turnaround we made our way to Sanlitun Workers’ Stadium to meet some of my friends and watch a Beijing versus Shanghai football match. The quality of play was awful, but the atmosphere was fun. I learnt about 10 new ways to swear in Chinese thanks to the surrounding sea of green Guoan supporters so we were quite relieved that Beijing cinched the victory to calm their fans! We went to Blue Frog in Taikooli, Sanlitun for a delicious burger for dinner and then Harry came out with me and my pals to celebrate a Guoan win. After a lie in, another day of intense walking started at the Summer Palace in the North West of Beijing. Unfortunately, due to it being a holiday weekend the crowds were unbearable so it was impossible to see the actual palace. Peking University is just two stops away on Subway Line 4, and is only accessible by student card or visitor pass. This meant that we finally had a little peace and quiet to wander around campus and visit the famous Weiming Hu (No Name Lake) and Boya Pagoda. 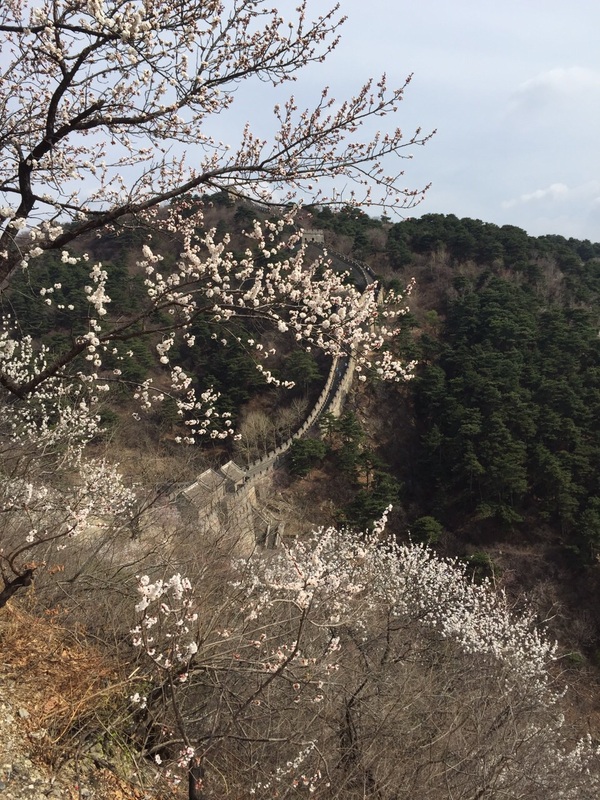 Spring is Beijing’s cherry blossom season, which makes every scenic spot 100x more beautiful, so I felt very proud to be a tour guide for this wonderful university. 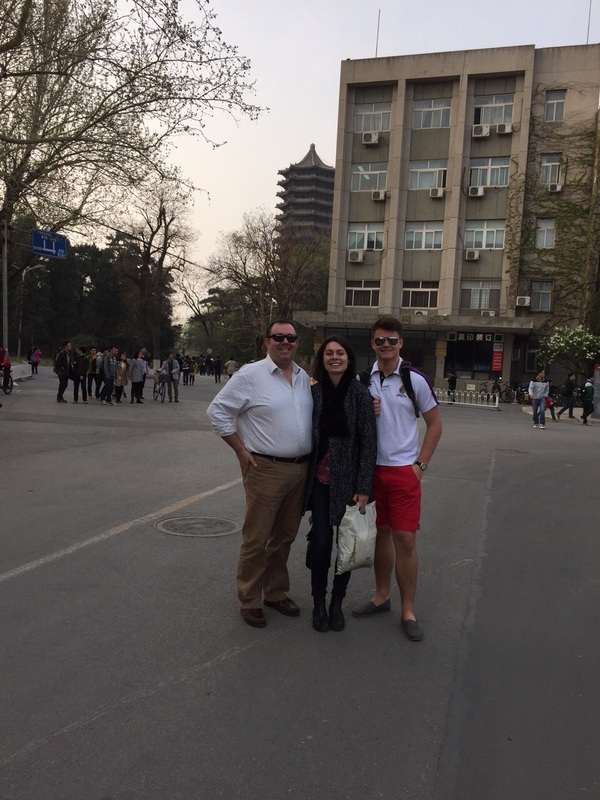 After a quick revival coffee at the Guanghua School of Management Café, and a pit-stop in Wudaokou to check out my apartment, we made our way back to the hotel to get changed before dinner. A trip to Beijing is surely incomplete without a visit to a Peking duck restaurant, so we got dressed up and made our way to Dadong in Jinbao Place, Wangfujing. Unsurprisingly, there are plenty of Peking duck restaurants in Beijing to choose from, including Duck de Chine and Quanjude, but I picked Dadong due to its good location near our hotel, and for that fact that its duck is reputedly the most lean in Beijing. The service was a little iffy as the waitress warned us that we had ordered too much but after we convinced her that it would be fine, we sat back and watched the magic happen. China is famous for its counterfeit goods, and we went to explore what Beijing had to offer on Sunday morning in the Silk Market. The Silk Market is actually nothing like a “market” – instead of stalls there are glass cubicles that look more like shops, with warnings against haggling and buying counterfeit goods on the outside. We blissfully ignored these warnings as we perused the aisles and aisles, floors and floors of the Silk Market. We were all successful in our buys, and it was great practice for my Mandarin – the sellers absolutely take you more seriously when they realise that you can speak Chinese and that you know paying £50 for counterfeit Nike trainers is unacceptable. 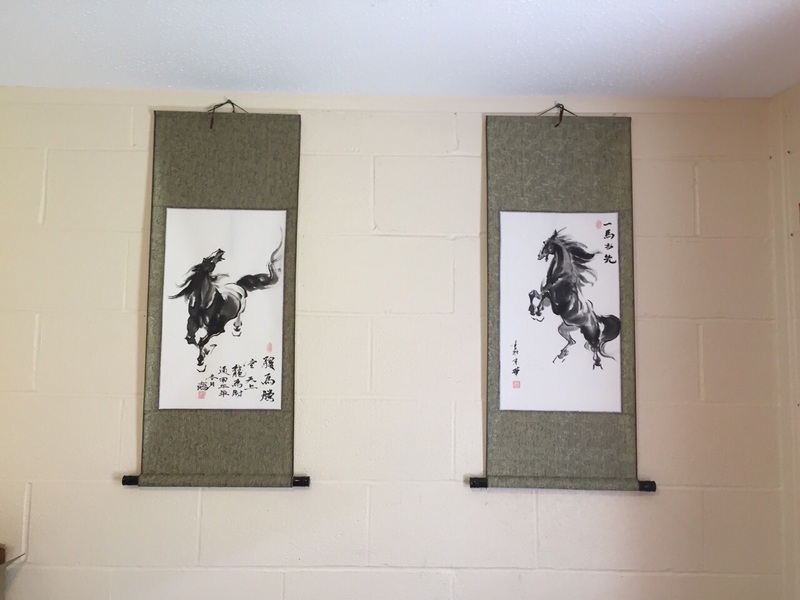 Harry’s horses – I haggled for a solid 25 minutes over these! In keeping with the shopping theme of the day, we bravely wandered into Wangfujing Food Street to see the delights of Beijing street food. The smell of stinky tofu and sweaty bodies mingles as your senses are further overwhelmed by the noise and the horrific “snacks” on display. Still-wriggling scorpion on a stick anyone? I don’t particularly like this street, but it’s definitely good for the shock factor, and kills any appetite a hungry tourist may have! 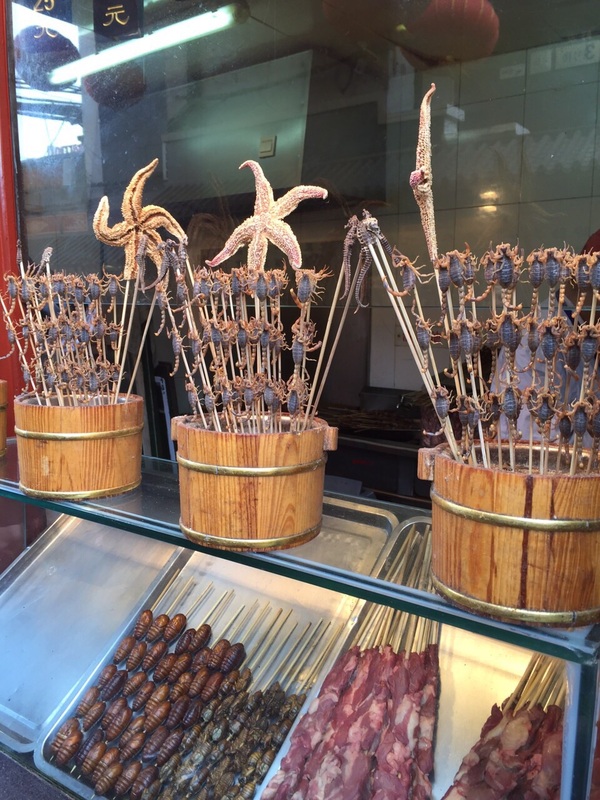 Impaled scorpions and starfish – tasty! We had a decent steak dinner in the hotel before meeting up with a friend for a quick drink, and then getting some well-earned rest. Tripadvisor rates the Temple of Heaven as no. 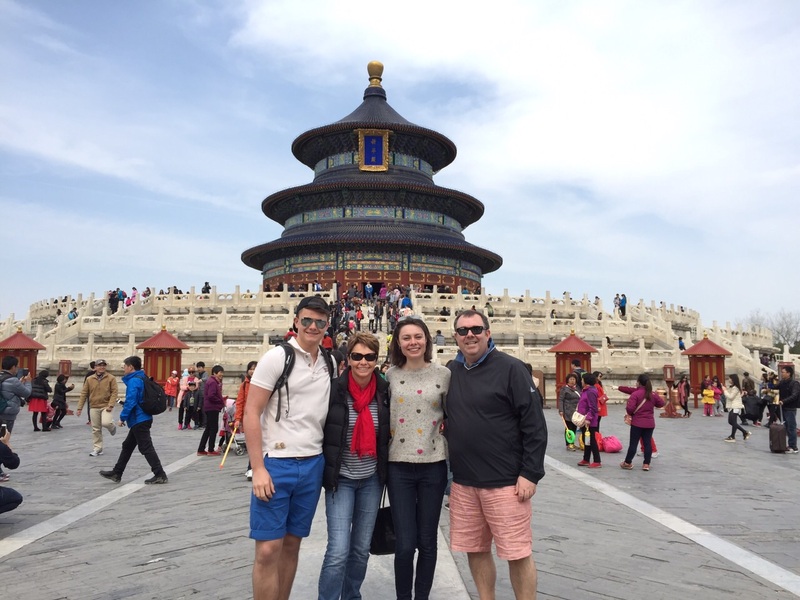 4 of the top things to do in Beijing, and as we had already covered the top three, it seemed like the sensible place to go for my Dad’s last day in Beijing (my Mom and brother left the next day). We were once again blessed with beautiful weather as we made our way into the walled park towards the main Temple. While the Hall is obviously the centre of the park, it’s also a lovely place to go and see Chinese people chilling and keeping themselves amused with musical instruments, food, and of course cards! 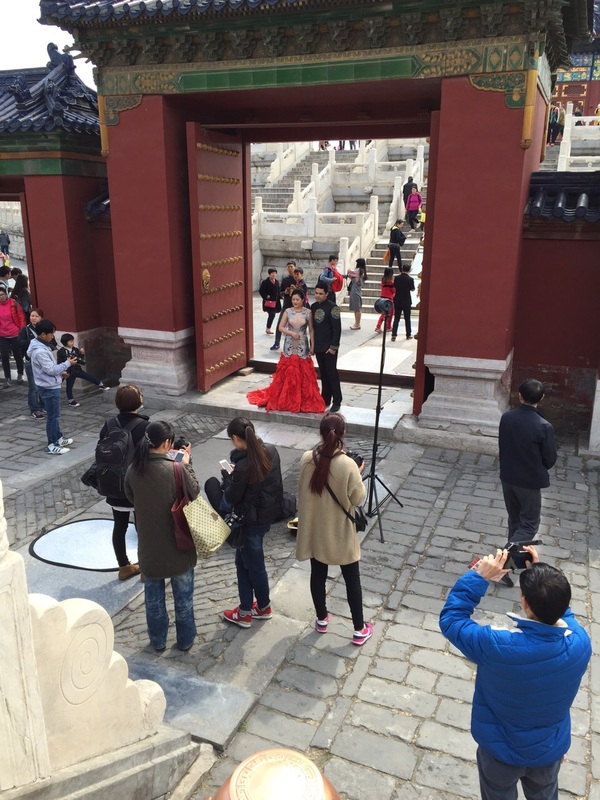 We were also surprised to find out that the Temple of Heaven is THE place for wedding photos in Beijing – we saw at least seven couples getting their pre-wedding wedding photos, as is the custom here. It was stunning until we took a closer look and saw the hastily pinned backs of rented dresses, with rather unflattering holes adorning the zip-line. After my Mom and I had finished studying dresses, we made our way through the park and back around to the subway station. After saying goodbye to my Dad, we made another quick trip to the Silk Market before heading to Sanlitun for dinner at Flamme (would highly recommend their steaks!). 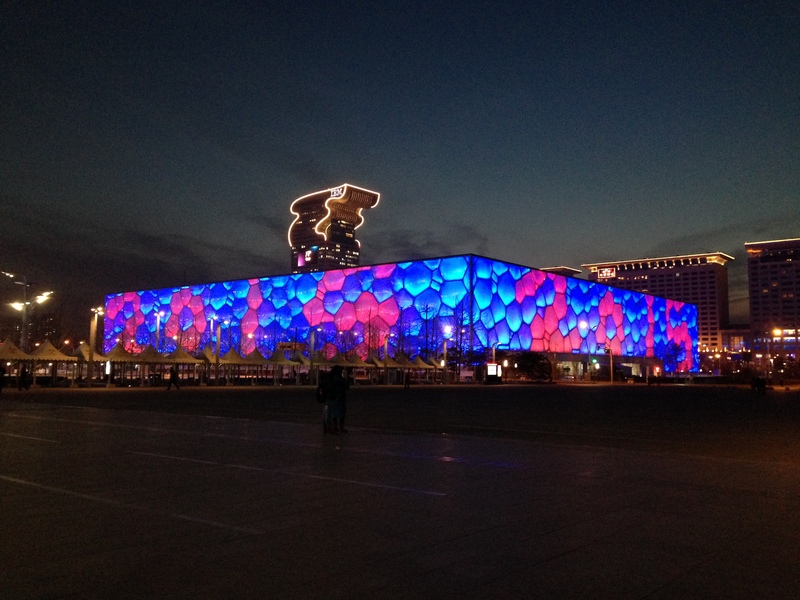 Our final tourist stop was the Olympic Park, home to the iconic Bird’s Nest Stadium and Water Cube. 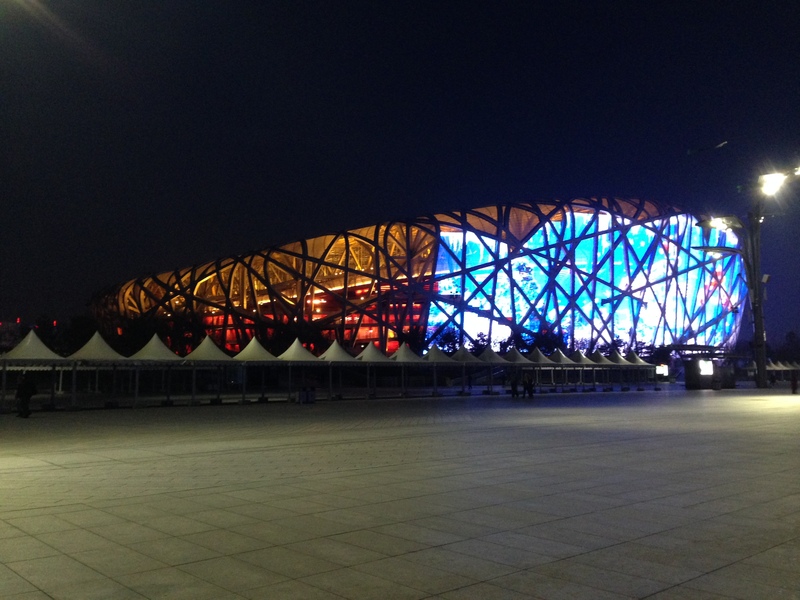 I’d only recommend visiting at night as it only truly comes to life when lit up beautifully in the colours of the Chinese flag. It’s free to enter and is open until late, so we made the most of soaking up our concluding cultural visit. Haggle! It’s fun and economical. 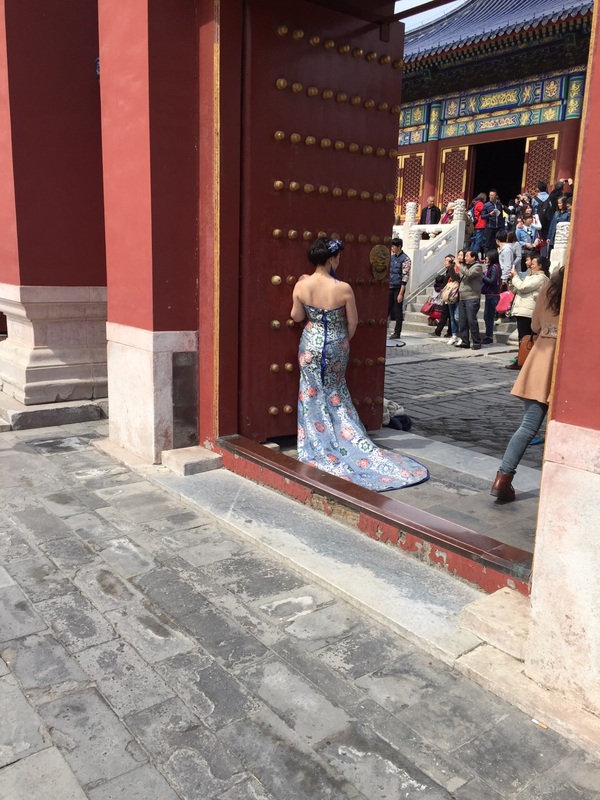 Avoid sightseeing tours if you can; Beijing is easy to get around thanks to the subway and the relative cheapness of taxis, and you can avoid being ripped off by tour companies. 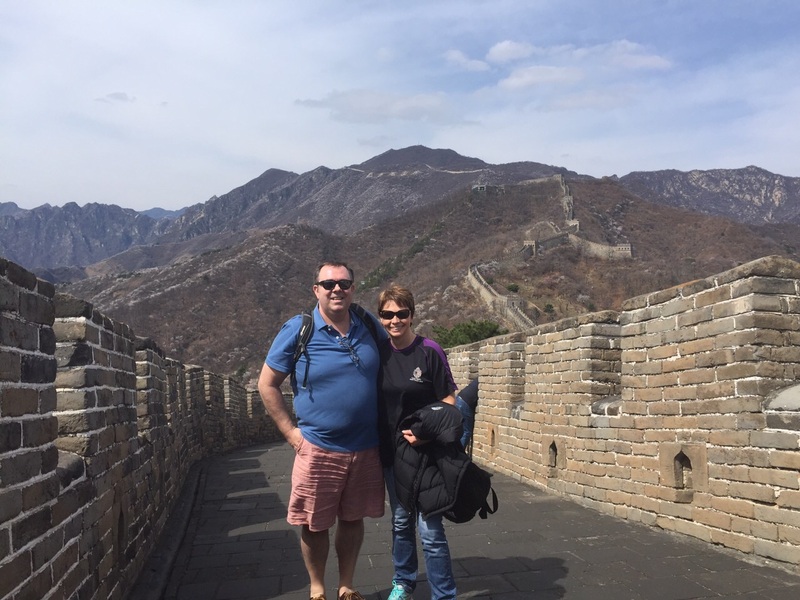 Avoid the Badaling part of the Great Wall! This is Badaling. You do not want this to be you. Take Beijing for what it is – China continues to develop every day and its character comes from being a little imperfect in places.